Christ Church Greyfriars, also known as Christ Church Newgate Street, was a church in Newgate Street, opposite St Paul's Cathedral in the City of London. Established as a monastic church in the thirteenth century, it became a parish church after the dissolution of the monastery. Following its destruction in the Great Fire of London of 1666, it was rebuilt to the designs of Sir Christopher Wren. Except for the tower, the church was largely destroyed by bombing during the Second World War. The ruins are now a public garden. Here's the our members favorite photos of "Ruins near City of London". 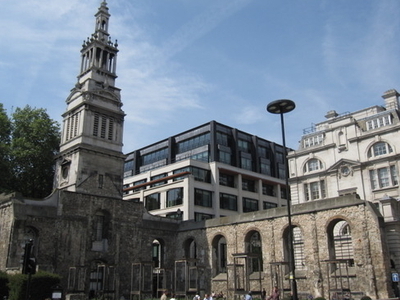 Upload your photo of Christ Church Greyfriars!